I'd like to start this review by saying that this is indeed a great scope. Once fully collimated it's incredibly sharp and gives beautiful quality views. But, there are a few issues. It's very easy to knock out of collimation if the screws aren't tight enough. The slow motion controls can get in the way when trying to pan in certain directions. The finderscope is kinda junk. But beyond that, it is a great starter scope and I would definitely recommend for someone trying out German equatorial mounts for the first time, though perhaps not as a first reflector. Follow the instructions and it goes together easily. 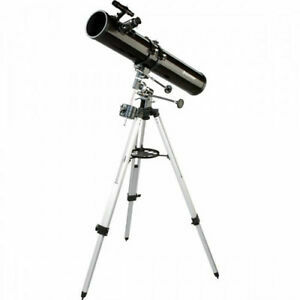 I found this to be a great telescope for me as a novice and first time user. Follow the instructional discs provided and you to can be the neighborhood astronomer. Easy to use if you take the time to learn the specifics of the instrument as with any new piece of equipment. I really enjoy exploring the night sky much more now with this telescope. A pretty good telescope for the money. I bought this for my girl friend for Christmas. So far, because it's been cold out, I've only used it once, just to look at the moon (in the daytime no less). Seems like a pretty good telescope, except for one thing...the long rods that move the telescope gradually left to right and up/down could not be of poorer quality. They are cheap plastic and somewhat fragile. However, the rest of the telescope seems to be of pretty decent quality, and very affordable. Because it is high quality. Great product for what I paid for it..